The elevated price of oil and other hydrocarbon fuels has made alternative energy systems an economic issue and not only an environmental one. Due to exponential growth in populations, emerging economies and consequently similar growth in fuel consumption, it is reasonable to expect continued elevation in prices of fossil fuels. This finite reserve of fuel will become more expensive as demand grows and supplies diminish. In contrast the sun, directly & indirectly, provides us with an infinite supply of energy. Harnessing the power of the sun is one of the major missions of Energy International Systems Group, Ltd. Since the mid 1970s, the company has been developing advanced thermodynamic systems for the collection of solar energy with the ultimate aim of developing a self-sufficient domestic energy system. Most of the various components for such a system have since been developed, making it an economically feasible enterprise. The EIS 1000 solar panels achieve peak performance very quickly due to their absorption efficiency and relatively low thermal mass. This is critical for performance in shorter winter days. Similarly the efficiency of the EIS 500 Vacuum Super Insulation (175°c-200°c) allows for longer peak operating hours, assuring thermal storage around the clock in areas of sufficient average irradiation. Combining the above two technologies & several others, Air Conditioning & complete energy systems will be available. Micro-generation of electricity is now considered feasible, PV & wind are typical examples, the latter with about 15% efficiency. EIS on the other hand, because of it's unique thermodynamic approach, will achieve about 70% overall efficiencies. This will ultimately lead to savings of the order of 90-100% on average household energy bills. Needless to say these systems can work anywhere the sun shines, however the number of panels required will vary depending on where you are on the planet. 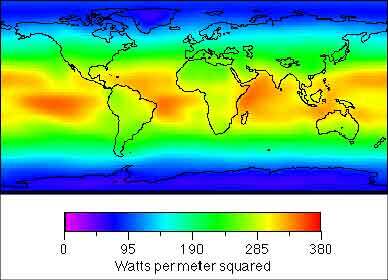 Obviously at the North & South Poles are difficult because they only get radiation for 6 months of the year; anywhere else solar radiation should be able to contribute to any household's energy input. For example, based on hourly solar radiation figures falling on the town of Nottingham in the UK, not renowned for its sunny climate, the average home could be totally energy sufficient with about 20m2 of the EIS 1000 solar panels. This is less than the average area of one side of a terraced house roof. Obviously it depends upon how many people occupy any property and what their energy consumption is, however areas of higher irradiation will normally require less panel area. 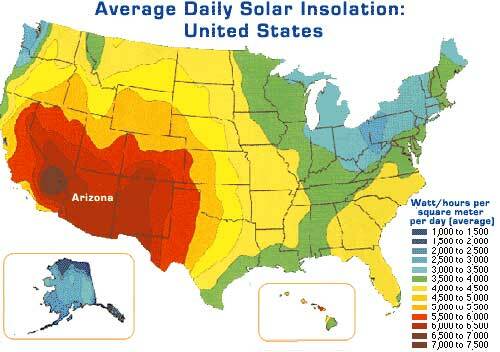 The above map and table shows the average annual global irradiation from this we can see that the potential market for solar thermal systems is vast. The components designed by EIS for their own solar thermal systems have a broad application across a spectrum of industries. For instance, the Caribbean islands, like many other parts of the world, rely on imported refined petroleum products for their energy needs. Tourism is a major component of their GDP and the hospitality industry is an energy intensive industry. The air-conditioning component costs alone must be having a serious impact on profitability for the industry in those island nations. Refrigeration costs in perishable goods must also be rising dramatically. EIS’s integrated energy systems will provide the solution across these static energy requirements.